Fleener with the Stanford Cardinal in 2011. Fleener was named an All-American by CBSSports.com as a senior in 2011. Fleener was considered a top tight end prospect for the 2012 NFL Draft. At the NFL combine, he benched 27 reps of 225 at 6-6 244, though he did not run because of an ankle injury. Fleener (right) and quarterback Andrew Luck (left) in their NFL debuts in 2012. The Indianapolis Colts made Fleener the 34th overall selection in the 2012 NFL Draft after drafting his college quarterback, Andrew Luck, 1st overall. Fleener was the first tight end drafted in the 2012 NFL draft. On July 25, he and the Colts agreed to a 4-year contract worth $5.431 million. Fleener made his regular season debut in Week 1 against the Chicago Bears, recording six receptions for 82 yards. He would struggle through the early season, before recording his first touchdown reception against the Detroit Lions in Week 13. Fleener finished the 2012 regular season with 26 receptions for 281 yards and two touchdowns. He recorded three receptions for 25 yards in the Colts Wild Card loss to the Baltimore Ravens. Fleener began the 2013 preseason as the backup to Dwayne Allen. He missed the final two weeks of preseason after suffering a knee injury. Allen would be placed on injured reserve after Week 1, making Fleener the starter for the rest of the season. He recorded his first 100-yard receiving game in Week 11 against the Tennessee Titans, making eight receptions for 107 yards. Fleener finished the 2013 season with 52 receptions for 608 yards and four touchdowns. In the Colts Wild Card playoff game against the Kansas City Chiefs, he would have five reception for 46 yards and a touchdown to assist in the Colts' 45-44 comeback win. On March 9, 2016, Fleener signed a five-year, $36 million contract with the New Orleans Saints. ↑ "CBSSports.com 2011 College Football All-America Team". CBSSports.com. 7 December 2011. Retrieved 17 June 2015. 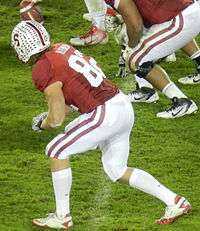 ↑ "Coby Fleener - Stanford, TE : 2012 NFL Draft Scout Player Profile". Retrieved 17 June 2015. ↑ Lourie, Steven. "Coby Fleener Interview". Retrieved 2012-04-26. ↑ Lourie, Steven. "Indianapolis Colts 2012 Draft Grades". Retrieved 2012-04-28. ↑ "2012 NFL Draft Tracker â€". Nfl.com. Retrieved 2012-12-13. ↑ "Indianapolis Colts reunite Coby Fleener with Andrew Luck". NFL.com. April 27, 2012. Retrieved December 13, 2012. ↑ "UPDATE:Colts Sign Coby Fleener (Details Included)". Everything-colts.com. July 25, 2012. Retrieved December 13, 2012. ↑ Alper, Josh (August 19, 2013). "MRI on knee clear for Coby Fleener; Dwayne Allen will return to practice". nbcsports.com. Retrieved January 8, 2014. ↑ Rosenthal, Gregg (March 9, 2016). "Coby Fleener agrees to 5-year, $36M deal with Saints". NFL.com. Retrieved March 9, 2016.